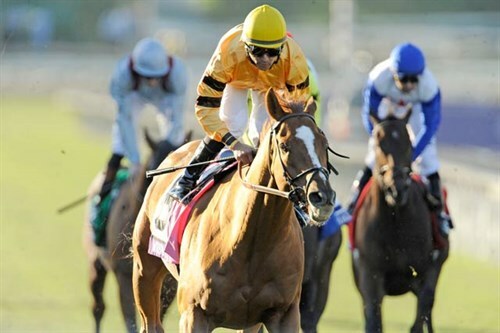 Wise Dan, a winner of six major stakes races in the United States and Canada last year, was named the 2013 Horse of the Year Saturday evening at the 43rd Eclipse Awards, presented by Daily Racing Form, Breeders’ Cup and The Stronach Group. Wise Dan won the Horse of the Year Award in 2012, as well. The Eclipse Awards, held at Gulfstream Park in Hallandale Beach, Fla., honor excellence in Thoroughbred racing and are voted on by representatives of the National Thoroughbred Racing Association, Daily Racing Form (DRF) and National Turf Writers And Broadcasters (NTWAB). Owned and bred by Morton Fink of Northbrook, Ill., Wise Dan finished first in the balloting with 208 votes, followed by Reeves Thoroughbreds’ Mucho Macho Man, winner of the Breeders’ Cup Classic, with 21 votes and Will Take Charge, winner of the Travers Stakes, Pennsylvania Derby and the Clark Handicap, with 15 votes. Wise Dan also won the Older Male and Male Turf Eclipse Awards this evening, and becomes the first horse ever to win three Eclipse Awards in consecutive years, having also swept the Older Male, Male Turf and Horse of the Year trophies in 2012. As a 6-year-old in 2013, Wise Dan—trained by Charles LoPresti—won six races from seven starts, winning all of his starts on turf and suffering his only defeat when the 1 1/16 mile Shadwell Turf Mile (Gr. 1) at Keeneland was shifted to the main track due to heavy rains. He finished second in the Shadwell. Wise Dan began the year by winning the Maker’s 46 Mile (Gr. I) at Keeneland on April 12. He next won the Churchill Downs Turf Classic (Gr. I) at 1 1/8 miles by on May 4 by 4 ¾ lengths, and stayed at Churchill to win the one mile Firecracker Handicap (Gr. II) at Churchill by two lengths on June 29; both wins at Churchill came over yielding turf courses. Wise Dan continued winning over the summer, capturing the one mile Fourstardave (Gr. II) at Saratoga by 1 ¼ lengths and the Ricoh Woodbine Mile (Gr. I) at Woodbine in suburban Toronto by 3 ½ lengths. 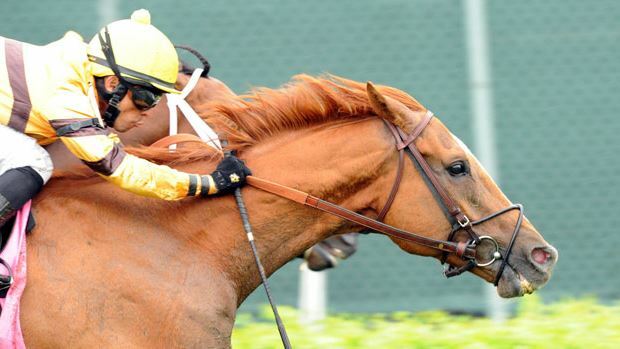 Following his lone season defeat, Wise Dan rebounded to win the $2 million Breeders’ Cup Mile (Gr. 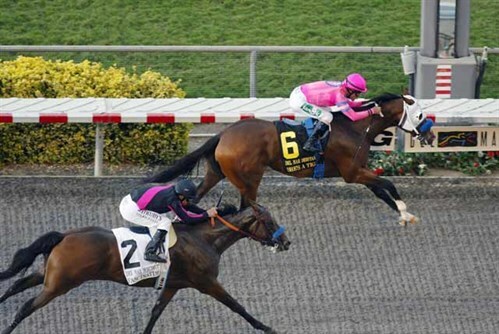 I) at Santa Anita Park for the second year in a row on November 2, his final start of 2013. Wise Dan finished the year with $2,722,432 in total 2013 earnings. 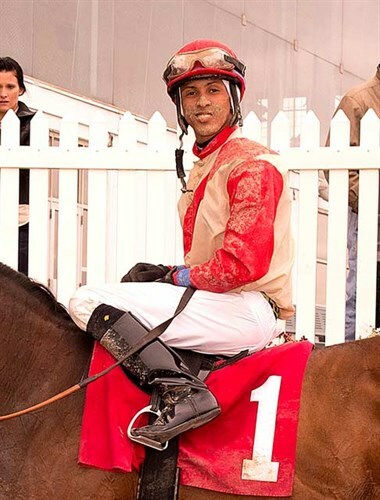 Jose Lezcano rode Wise Dan in the Maker’s 46 Mile, the Turf Classic, and the Breeders’ Cup Mile, replacing John Velazquez, who was injured earlier in the Breeders’ Cup program that day. Velazquez rode Wise Dan I in the Firecracker, Fourstardave, Woodbine Mile and the Shadwell Turf Mile. Wise Dan has won 19 of 27 career starts and has career earnings of $6,296,850. He is a chestnut Kentucky-bred gelded son of Wiseman’s Ferry out of Lisa Danielle by Wolf Power. In voting that concluded January 3, 2014, Eclipse Awards voters cast their ballots to rank the top three horses and individuals in each Championship division on a 10-5-1 point system basis. This voting established the top three finalists in each division, whose names were released on Jan. 8, 2014. The 2013 Eclipse Award winners and results for each category appear below. Digital images from the Eclipse Awards ceremony are available from Horsephotos. Shared Belief, 115; New Year’s Day, 99; Havana, 24; Honor Code, 5; Outstrip (GB), 4; Tamarando, 1; No Vote 1. She’s a Tiger, 212; Chriselliam (IRE),15; Ria Antonia, 10; Sweet Reason, 3; Stopshoppingmaria, 3; Streaming 3; My Conquestadory, 2; Artemis Agrotera, 1. Wise Dan, 123; Mucho Macho Man, 93; Game On Dude, 31; Flat Out, 2. Royal Delta, 234; Dank (GB), 5; Joyful Victory, 3; Tiz Miz Sue, 2; Dance to Bristol, 1; Laughing (IRE),1; Brandy’s Secret, 1. Voter Abstention, 1. No Vote, 1. Points Offthebench, 125; Secret Circle, 70; Sahara Sky, 45; Justin Phillip, 4; Private Zone, 2; Immortal Eyes, 1; Strapping Groom, 1. Voter Abstention, 1. Groupie Doll, 192; Mizdirection, 45; Cluster of Stars, 7; Dance to Bristol, 5. Wise Dan, 243; Magician (IRE), 4; Obviously (IRE), 1; Point of Entry, 1. Dank (GB), 229; Laughing (IRE), 8; Mizdirection, 8; Alterite (FR) 1; Egg Drop, 1; Emollient, 1; Kitten’s Dumplings, 1. Divine Fortune, 112; Italian Wedding, 27; Gustavian, 25; Alajmal, 21; Mr. Hot Stuff, 12. Voter Abstentions, 52. Wise Dan, 208; Mucho Macho Man, 21; Will Take Charge, 15; Dank (GB), 1; Princess of Sylmar, 1; Royal Delta, 1. Voter Abstentions, 2. Kenneth and Sarah Ramsey, 235; Midwest Thoroughbreds Inc., 4; Morton Fink, 3; Gary and Mary West, 2; Jungle Racing, 1; Maggi Moss, 1. Voter Abstentions, 3. Kenneth and Sarah Ramsey 221; Adena Springs, 17; Morton Fink, 4; Darley 1; WinStar Farm, 1. Voter Abstentions, 5. Todd Pletcher, 183; D. Wayne Lukas, 21; Jerry Hollendorfer, 9; Bill Mott, 7; Charles LoPresti, 6; Shug McGaughey, 6; Bob Baffert, 5; Steve Asmussen, 3; Chad Brown, 2; Kathy Ritvo, 2; Ollie Figgins, 1; David Jacobson, 1; King Leatherbury, 1; Dale Romans, 1. Voter Abstention, 1. 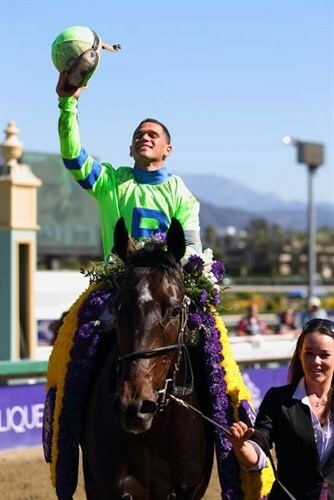 Javier Castellano, 134; Gary Stevens, 65; Joel Rosario, 21; Mike Smith, 19; John Velazquez, 8; Corey Nakatani 1. Voter Abstention, 1. Victor Carrasco, 172; Edgard Zayas, 18; Manuel Franco, 13; Emmanuel Esquivel, 8; Jose L. Ortiz, 4; Dylan Davis, 3; Trevor McCarthy, 2. Voter Abstentions, 29.